ITER will be equipped with a cooling water system to manage the heat generated during operation of the tokamak. The internal surfaces of the vacuum vessel (first wall blanket and divertor) must be cooled to approximately 240 °C only a few metres from the 150-million-degree plasma. Water will be used to remove heat from the vacuum vessel and its components, and to cool auxiliary systems such as radio frequency heating and current drive systems, the chilled water system (CHWS), the cryogenic system, and the coil power supply and distribution system. The cooling water system incorporates multiple closed heat transfer loops plus an open-loop heat rejection system (HRS). Heat generated in the plasma during the deuterium-tritium reaction will be transferred through the tokamak cooling water system (TCWS) to the intermediate component cooling water system (CCWS), and to the HRS, which will reject the heat to the environment. 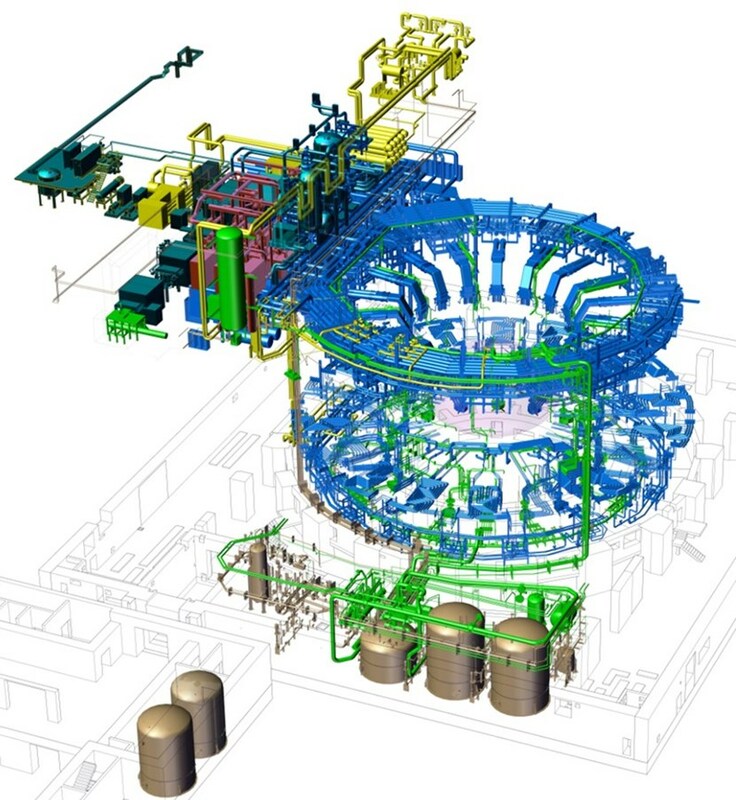 ITER will be equipped with a cooling water system to manage the heat generated during operation of the Tokamak. The ITER Tokamak and plant auxiliary systems will produce an average of 500 MW of heat during a typical plasma pulse cycle, with a peak of more than 1100 MW during the plasma burn phase; all of this heat needs to be dissipated to the environment. This is accomplished by the evaporation of HRS water as it passes through the induced-draft cooling towers. The high rate of evaporation concentrates minerals in the HRS water; as a result, part of the water is continuously discharged from the system and replaced by water from the Canal de Provence. The discharged water (blowdown) passes through a series of control basins where the water is tested for various parameters such as temperature (maximum 30 °C), pH, and the presence of hydrocarbons, chlorides, sulphates and tritium. Only water that meets the stringent environmental release criteria established by local authorities is released into the Durance River. During plasma operations, the combined flow rate of all water in circulation in the cooling water system loops is approximately 33 m³/s, flowing through pipes with nominal diameters of up to 1.6 metres. The cooling tower area is under construction now. Visit the related BUILDING ITER page here.